A rifle in the hands of a skilled owner is the choice of weapons for personal defense. The operator can effectively control close quarter or distant threats. All rifle courses cover in depth safety and handling, cleaning and maintaining of weapon, administrative and action loading, malfunctions and clearing, sidearm transitions, multiple threats, cover and concealment, stress inoculation, situational awareness, and flashlight deployment. Shooting with movement, manipulation skills and communication are also covered in varying depths dependent upon the class’s skill level. Complex targets are offered in most classes. A 4 hour course that provides the student with the basic skills and mindset required to confidently operate a rifle in a violent situation. 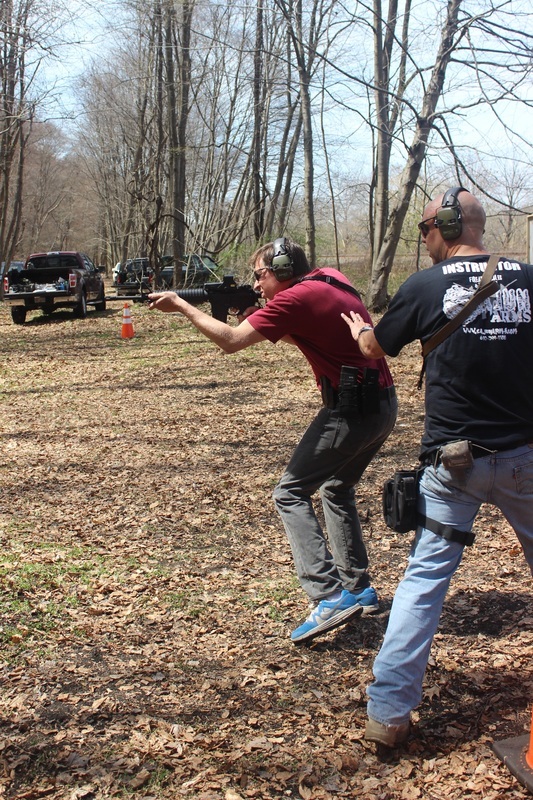 Intro is geared toward the student with little or no experience operating a defensive rifle. The class starts with a lively classroom session followed by active drills on the range. Close quarter and close range engagement are covered. After successful completion of this course, students will be better prepared and more confident to defend themselves and their families if required. While the class is more geared toward AR15 platform any Carbine rifle is welcome from AK47, Mini-14, to pistol caliber carbines and 22LR carbines. A 5 to 6 hour course that provides the student with the basic skills and mindset required to confidently operate a rifle in a violent situation. 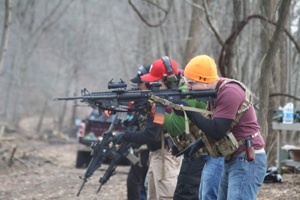 Intro is geared toward the student with little or no experience operating a defensive rifle. The class starts with a lively classroom session followed by active drills on the range. Close quarter and close range engagement are covered. After successful completion of this course, students will be better prepared and more confident to defend themselves and their families if required. While pistols are small and concealable, they make a better back up weapons rather than primaries. Empower yourself with the knowledge to effectively defend self and loved ones with a rifle. Iron sights or very low powered scopes are acceptable. This 6 to 8 hour class will teach you how to use your rifle to its full potential. A 3 hour course building on the skills and mindset learned in previous classes. LOW LIGHT will teach the student to confidently operate a rifle in a violent situation, IN THE DARK. A truly unique opportunity to train with your rifle in a scenario that few other ranges and schools offer! This session is held completely on the range, starting with a lecture on flash light techniques followed by an intense range session. Iron sights or very low powered scopes are acceptable. A weapon mounted light is required. After successful completion of this course, students will be prepared and confident to defend themselves and their families in the DARK! 300 rifle and 50 pistol rounds required. A class that takes you from the end of the muzzle to 225 yards in field situations. Known distances as well as “unknown” are reviewed. Field distance estimation and use of range finders are taught. Emphasis on position shooting, use of slings and trigger discipline. Paper and steel targets are engaged. Bolt-action non-magnums are encouraged. Bipods or improvised field rest are required. A semi-automatic rifle. No magnum calibers. Students are required to have ANSI eye protection, and ear protection. Digital ear protection is REQUIRED to ensure all direction and commands are heard and understood. You will need a sling, a minimum of 4 magazines for your rifle, a belt or vest with pouches for at least 3 rifle magazines. Back up iron sights are encouraged. A red dot or optic is OK but it must have the ability to be dialed down to 1 power. Rifle caliber pistols are not permitted with or without a brace. Legally obtained SBR’s are permitted if a copy of the tax stamp is presented prior to class. Cleaning and clearing kit and Field repair parts are always helpful. A sidearm, quality holster, belt, and 2 magazine carriers mounted on belt. A minimum of 3 speed loaders or magazines. Knee and elbow protection is a good idea, but not mandatory. Serpa Holsters are not permitted in class. Hat, neck scarf, bug spray, rain gear and bags to carry your gear. Clothing for seasonal weather during outdoor classes is required in order to stay comfortable. A semi-automatic rifle or bolt rifle with enough quality “glass” to shoot course targets. Sling and bipod or rest. Spotting scopes are a great idea but not required.